When it comes to sewer line repair, there are many culprits that could be the cause of the pipe damage. For example, root growth, calcification, aging lines, and the shifting of the ground could cause damage to the lines. In fact, nearly one million North American homes and businesses suffer pipe damage each year. That adds up to millions of dollars in repairs, and can also result in increased taxes because municipalities must also bear the cost of repairs when sewage systems begin to falter. There are two different types of sewer lines: public and private. A sewer line can either be the responsibility of the homeowner, or the public utilities company. The best way to determine who is responsible to repair the damage is to ask the local utility company. The age of the sewer line is typically taken into consideration when determining whether a pipe is either public or private property. The local utility company is required by law to have a map that blueprints the location of the water and sewer lines in and around the home, or place of business. Because of that, they are the best resource to help determine what is the property owner’s responsibility, and what is the city’s responsibility. Also, it’s important to note that a drain, which carries the water to the sewer line is also the responsibility of the property owner. When the line is on private property, it is solely up to the owner to repair the damage, or break. The section of sewer lines and pipes that extends from the public line to the home or place of business is considered private. 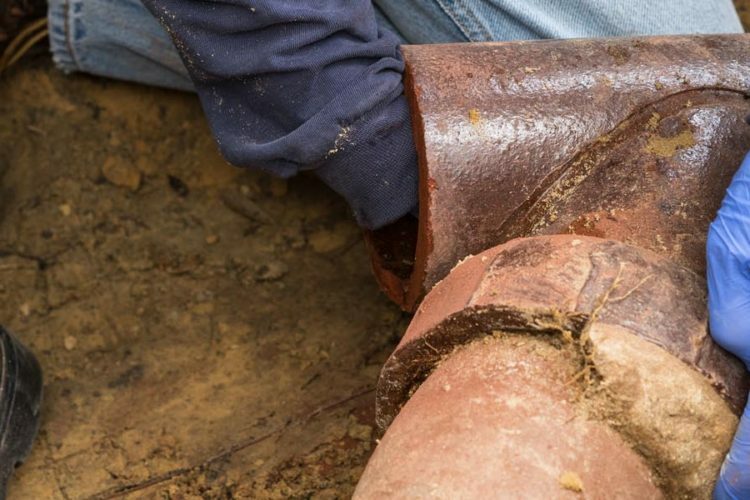 While it is possible for the owner to repair the lines, E & K Contractors recommends hiring a professional, licensed, and bonded contractor to repair the sewer line. A professional can determine the cause, see if there are any other utilities that must be considered, and has the knowledge to get the job done quickly, efficiently, and properly. The question remains, what is the best way to handle a sewage problem, whether it is public or private? The main sewer line can become clogged for many reasons, and when it occurs, it is the responsibility of the public utility company to come and fix it. They should be called first, as they will send out a licensed specialist who can quickly assess the problem, and have it repaired accordingly. However, if it can be determined that the issue began from the home, or place of business, the repair and inspection is the responsibility of the property owner. Not all repairs require digging. Trenchless sewer lines can be used as a replacement to the existing lines. This method can be cost-effective, wards off any root growth, and maintains the integrity of the sewage pipes, and can also increase the flow capacity. A water or sewer line replacement isn’t as simple as one phone call. A call to the public utility company should be first, followed by a reputable plumbing company. At E & K Contractors, we can help determine the location, assess the damage, and work with the property owner to repair the damage correctly and professionally. I think there might be problems with my sewer line. It makes sense that it would be my responsibility to get a professional to repair it! I’ll be sure to find a plumber to do that as soon as possible. It’s difficult to deal with a blocked sewer line especially if it happens to be on private property. When dealing with this it’s important to call for the proper utility company to come out and get it fixed since they would be dispatching a specialist who can examine blocked sewer lines to determine where the break is and how it can be fixed. If I had the chance to take a look at a blocked sewer line I would have to be careful since these are very messy to deal with when they explode and cause a lot of trouble.